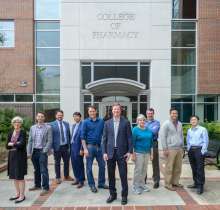 The department of pharmacodynamics in the University of Florida College of Pharmacy has attained a perfect score, with 10 out of 10 tenure-track faculty being federally funded. The awards come from various federal institutions, but all 10 have at least one grant from the National Institutes of Health, or NIH. 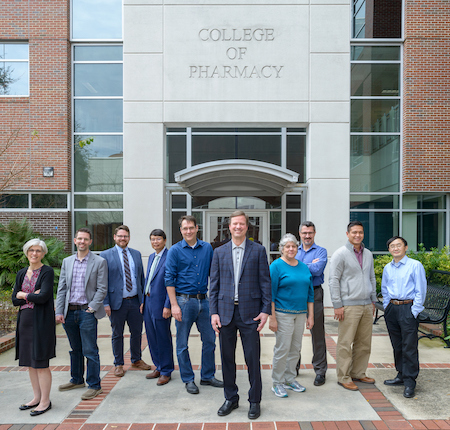 All 10 tenure-track pharmacodynamics faculty in the UF College of Pharmacy are federally funded. The 10 pharmacodynamics faculty currently serve as principal investigators on 25 different federally funded grants worth nearly $27 million. These awards fund diverse research projects, including a study of the relationship between alcohol and the brain’s natural release of oxytocin and one that explores the effects of individual kratom-derived compounds on alkaloid receptors. This $400,000 R21-designated — high-risk, high reward — grant from NIH’s National Institute on Alcohol Abuse and Alcoholism, allows associate professors Joanna Peris, Ph.D, and Eric Krause, Ph.D., to explore the anecdotal claim that overconsumption of alcohol makes social relationships less rewarding. Oxytocin, a natural, endogenous peptide known as the “love hormone,” plays many roles in human relationships, including social bonding, sexual reproduction in both men and women, as well as childbirth in women. Although we tend to think of alcohol as increasing our social interactions, irresponsible consumption may actually interfere with the natural effects of oxytocin. Ultimately, this may make future relationships less rewarding, as alcohol takes the place of firing those neurons, satisfying the reward pathway. Since kratom, or Mitragyna speciosa, has caught the attention of the U.S. government and the nation at large, the UF College of Pharmacy has secured myriad grants to study the plant, which has potential to treat opioid misuse and physical dependence. The NIH’s National Institute on Drug Abuse most recently awarded principal investigators McMahon and medicinal chemistry professor Chris McCurdy, Ph.D., a $3.5 million UG3/UH3grant. McMahon and Jay McLaughlin, Ph.D., an associate professor, run in vivo pharmacodynamics tests to determine the effects of individual kratom alkaloids on receptor targets in the brain. The pharmacodynamics side of the kratom study continues to fill the knowledge gap of the substance’s effects on the brain. Since 2016, four new faculty, including the department chair McMahon, joined the department. They have significantly contributed to the growth in research funding. The 10 faculty members include assistant professors Guillaume de Lartigue, Ph.D. and Brandon Warren, Ph.D., associate professors Krause, Peris, Charles J. Frazier, Ph.D.; Bin Liu, Ph.D.; McLaughlin, and professors McMahon, Maureen Keller-Wood, Ph.D. and Daohong Zhou, M.D.